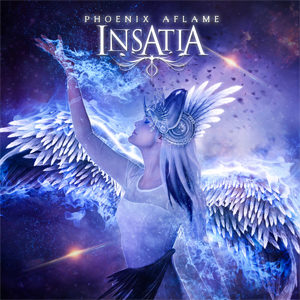 INSATIA Release Newest Single, "We Are The Grey"
American Symphonic power metal group INSATIA has released the second single, "We Are The Grey", off of their upcoming album, Phoenix Aflame, due out June 23, 2017 via Pitch Black Records. "We Are The Grey" and Phoenix Aflame are available to pre-order HERE now. Vocalist Zoë Federoff comments that the new track "was actually the first song we had written for this album - originally I had constructed it to be a ballad, but as we started working on it, it became more straight up power metal. I don't like discussing my lyrics in too much depth with certain songs, because it's fun to see people apply their own meanings to them. This is definitely one of those songs." "Intro (Land Of The Living)"